As the year-long conflict polarises Syrian society, Omar Abdel-Razek from BBC Arabic finds an Orthodox Christian community worried it could face trouble from both the government and opposition. "The university has become a battlefield between the supporters and the opposition of the regime." That was what Lena (not her real name), a medical student at the University of Aleppo, had said in her email informing me that she will not be able to meet me at campus as agreed. She continued: "As a Christian, both sides are suspicious of me. In fact I'm not with or against the regime." Lena said she never cared about politics until she and her family found themselves talking about it everyday when the crisis in Syria began over a year ago. "We followed the simple rule 'don't talk politics', and then you can do anything else," she said. In the past, when I was going to my exams, my mother's main concern for me was to do an 'excellent' job. Now her main concern is for me not to take a taxi because of the kidnappings," Lena said. While some Christian intellectuals have openly opposed President Bashar al-Assad and were imprisoned by his regime, it seems that the majority fear the unknown if the regime were to collapse. They cite the situation of Christians in Iraq and recently Egypt as the basis for their fear. The Syriac Orthodox Church was once one of the major Christian churches in the Eastern Roman Empire; Syriacs translated Greek documents into Arabic. Their number has decreased now to 140,000 according to Father Gregorious Yohanna Ibrahim, the Metropolitan of Aleppo. When I met him in his monastery I asked how the Christian minority is dealing with the crisis which has engulfed the country. "Do not call us a minority, we are a unique community with deep roots in the country," he said angrily. "The opposition and the regime committed mistakes, [they] did not return to wisdom, and blood brought more blood," he continued. "We call for dialogue that should include everybody who represents the opposition, not just those the government calls the opposition." I asked Father Gregorious Yohanna if some Christians side with the regime because of fear. "Look, we have concerns, we have great concerns, we can't wish the Iraqi model for anyone and the Christians of the region also feel uneasy with what happened in Egypt recently," he said. "Our concerns are not related to who will come to power, we are afraid that whoever will come may close their eyes and ears, or will not like to deal with us," he continued. "We don't fear the Islamists, we fear the violent extremists who will not accept the other," he said. When I visited, few people were out in the streets around the Greek Orthodox Patriarchate in the old city of Damascus. Names of the streets, buildings and bazaars in this tourist area, still carry much of its Christian past, but the church where I met Bishop Louka al-Khoury was nearly empty. Bishop Louka prides himself in belonging to the oldest Arab church. "Can you name one single Syrian party or political movement that did not have a Greek Orthodox among its leaders?" I noticed the nostalgic tone in his words. 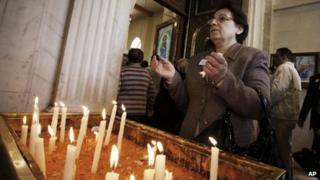 "Christian Syrians were accused of siding with the regime, but this is not true," he insisted. "Syrians belong only to their homeland not to regimes, it's that patriotism Christians have that made them the first to sacrifice for their country. "We have some fears no doubt, because we have never witnessed violence like that which we see on the ground now. "But we don't side with a regime; we side with our country and with anybody who serves our homeland and our interests," Bishop Louka al-Khoury said.